(CNN) -- Several samples of infant formula have tested positive for trace amounts of the toxic contaminant melamine or a related compound, the Food and Drug Administration said Thursday. 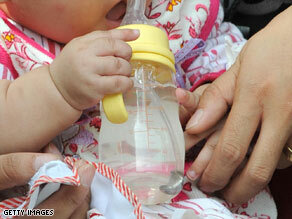 More than 12,000 children have been hospitalized in China after consuming melamine-tainted formula. Of 77 samples tested, one contained trace levels of melamine, FDA spokeswoman Judy Leon told CNN. A trace amount is defined as less than 2,500 parts per billion, she said. On Tuesday, the agency had said that one sample had tested positive. But Thursday, the FDA said two tests of a sample of Nestle's Good Start Supreme Infant Formula with Iron showed melamine at levels of 137 and 140 parts per billion. In addition, Mead Johnson's infant powder, Enfamil LIPIL with Iron, had three positive tests for cyanuric acid, at an average of 247 parts per billion, also well below the FDA trace level. Cyanuric acid is a compound created when melamine breaks down. The FDA said it checked with all manufacturers licensed to distribute baby formula in the United States and determined that none of the components in U.S.-sold infant formula are from China. Leon said the sample that tested positive most likely became contaminated through the manufacturing process or through contact with can liners. Last month, the FDA set the safety threshold for melamine at 2,500 parts per billion for foods other than infant formula. The agency said it did not have enough data to set a safety threshold for infants. A spokeswoman for the Atlanta, Georgia-based International Formula Council, a trade group, said she had not seen the data, but was encouraged that the quantity found was below levels deemed safe in infants by the governments of China, Malaysia, the Philippines, Hong Kong, Canada and New Zealand. "Apparently these trace levels can be found in lots of food," said spokeswoman Mardi Mountford. The FDA also found trace levels of melamine in several samples of medical formula supplements for the elderly, but the amounts posed no health risk to adults, Leon said. Though U.S.-based companies can import ingredients from China for nutritional supplements for adults, there is an import ban on dairy products and components, she said. Melamine is an industrial chemical used in the manufacture of can liners, flame retardant, cleaning products, fertilizers and pesticides. It does not occur naturally in food. Because it contains nitrogen, its addition to food products can wrongly suggest an inflated protein content. Ingesting melamine in large doses over an extended period of time could cause kidney stones and other illnesses, though small amounts pose no such danger for adults, agriculture and health experts say. Its presence in Chinese infant formula has led to the hospitalization of more than 12,000 children and the deaths of several in China, according to the FDA, which said it is not aware of any such illnesses in the United States. This month, the FDA announced that it was limiting the import of all dairy products from China until they have been proven free of melamine.